CHOP grew out of the doctoral studies of Stan Gale (see author profile) at Covenant Theological Seminary in St. Louis, Missouri. His course work in the study of revival and God’s use of prayer in that revival, as well as study of evangelism in the early church brought prayer to the fore as a means to draw near to God and to accomplish God’s goals in the lives of others. In other words, prayer affected both the one praying as instrument and the ones being prayed for as targets, to the accomplishment of God’s purposes. In mapping out the project study and dissertation, Dr. Phil Douglass, Dr. Gale’s advisor for his dissertation, suggested enfolding the dimension of spiritual warfare into the literature review and approach. The literature review exposed the great dearth of solid biblical material on the subject of spiritual warfare in evangelism. The review also showed how prayer could serve as an armament of the kingdom of God against the spiritual adversary believers face in the work of kingdom proclamation, evangelism. In preparing for the dissertation, two groups from several different churches were divided into a test group and a control group. A survey was developed that dealt with three areas related to personal evangelism: awareness of the evangelistic nature of everyday life, attitude of personal responsibility and involvement in evangelism, and actual activity in verbal witness to some degree. This survey was administered as a pre-test to each group. The test group went through an 8-week house of prayer using modified materials from what was then called Neighborhood Houses of Prayer (developed by John DeVries and Alvin Vander Griend, now called Houses of Prayer Everywhere [HOPE]), while the control group did not. The results were telling. Those involved in strategic prayer demonstrated clear increases in all three areas of awareness, attitude and activity in personal evangelism over the control group. Buoyed by these findings, materials that provided more direction, covering a longer period of time, and enfolding the dimensions of personal renewal, life-sphere mapping and spiritual warfare were developed. As these materials were used over time, they were continually refined from feedback and experience. Early versions of CHOP were introduced in the United Stated and on mission fields throughout the world. Reports continue to come in on how involvement in the ministry produces changed lives, both in those praying and in those targeted for prayer. At the time of this writing a new life cycle has begun as one young man just participated in a CHOP who himself had been the target of prayer in an earlier CHOP and had come to Christ. It is not unusual for participants to be active in ways they would not ordinarily be, by virtue of their involvement in a CHOP. People are hearing the gospel and the kingdom of God continues to grow as His people labor in strategic prayer. 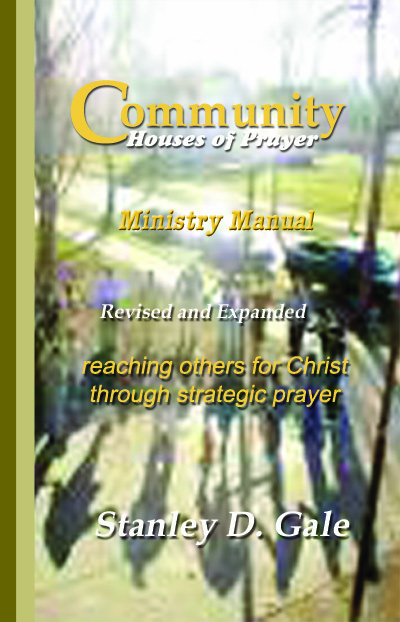 In 2007 the CHOP Ministry Manual was thoroughly revised and expanded to incorporate Input and feedback gained from those using the first edition as well as to make general improvements. Some of the changes include: placement of the Basic Training Lessons in the body of the book, inclusion of a fuller presentation of the gospel as a training tool, incorporation of excerpts from Warfare Witness as part of the Daily Prayer Guide for introduction and reinforcement of principles and practices inherent in the CHOP approach, thorough revision of the Daily Prayer Guide to aid in strategic prayer, pre-CHOP and post-CHOP guidelines, and a number of stylistic and content changes throughout for ease of use. An interview with Dr. Gale on CHOP can be found athttp://www.breakpoint.org/component/content/article/104-worldview-church/898-mobilizing-gods-people-for-prayer.